West End Dumplings: Winnipeg to lose another "Marina style" Safeway? Winnipeg to lose another "Marina style" Safeway? Last week, Red River Co-op announced that they are unable to renew the lease on their new grocery store at 1441 Main Street at Luxton Avenue. It was one of four outlets shed by Safeway after Sobeys bought them out in 2013. Though the owner hasn't publicly announced their plans for the site, it will likely include a redevelopment or outright demolition of the existing store, which opened in April 1965. It puts in doubt the future of one of the city's last "Marina style" Safeways. 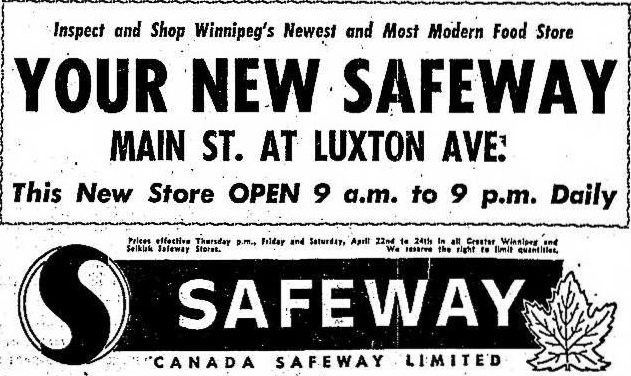 When Safeway entered the Canadian market in 1929 it used architecture as a key part of its part of its marketing. Local grocery chains of the era, including the likes of Mutual Stores and Neal's, were a collection of stores of varying sizes and styles. Safeway brought with them their new-build, "cookie cutter" design for their stores. A customer could recognize a Safeway store from a distance without having to see the sign. They could also shop at any Safeway store in town and find the same products in exactly the same place, thanks to identical floor plans. The longest-lasting store design appears to be the original one, (above), which lasted into the 1940s. Many of them still stand in Winnipeg to this day. Other waves of standardized stores came in the 40s and 50s. The 1960s brought a selection of styles for a new era. By the late 1950s Safeway was adjusting to a new retail reality that made its architecture more important than ever. Customers were flocking to the suburbs and commuting to and from work by car. This called for larger stores with huge parking lots set far back from urban highways and freeways. 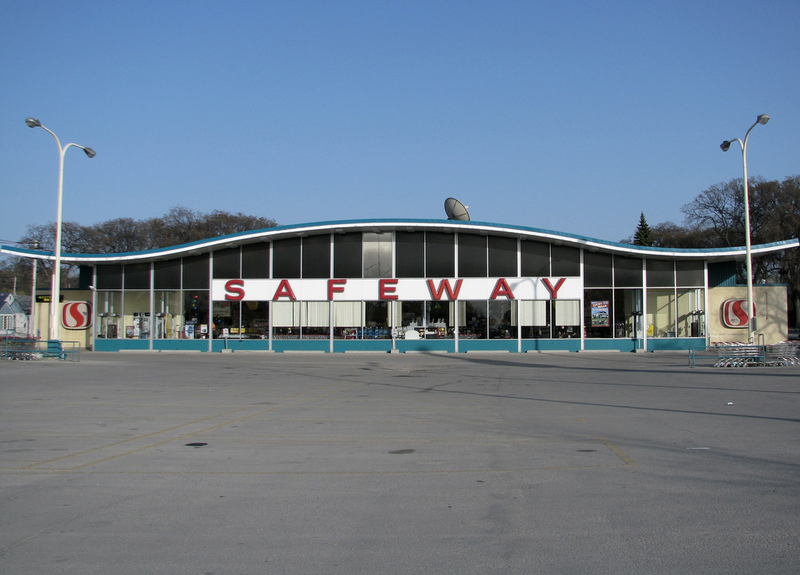 To catch the attention of customers that were now whizzing by at 60 kph or more, supermarkets turned to what the author of Main Street to Miracle Mile: American Roadside Architecture calls "flamboyant exterior wrappers". Bottom: Main Street, Winnipeg 2012, featuring the "gull wing"
Safeway's response was the creation of one of its most beloved, and still recognizable, store designs: the "Marina style". The name comes from the fact that the prototype store, designed by Wurster, Bernardi and Emmons, opened on San Fransisco's Marina Boulevard in 1959. The Marina style featured an arched roof and an uninterrupted front wall of glass with the store entrances offset to either end. It was such a hit that it soon rolled out across North America. There were a number of variations of the Marina style. Most of them had to do with the treatment of the roof line at the ends of centre arch. Some, including the original Marina store and Winnipeg's Salter Street store, end with a flat roof. Others, such as this Main Street store, have an upturned roof line, which some have nicknamed the "gull-wing" variation. It is hard to tell exactly how many Marina style Safeways were constructed in the city. Based on sketches used in newspaper "grand opening" ads, it was about a dozen. Most of these stores have been demolished and a couple have been so drastically renovated, such as that first one at Ellice and Wall, (above), that they are unrecognizable. 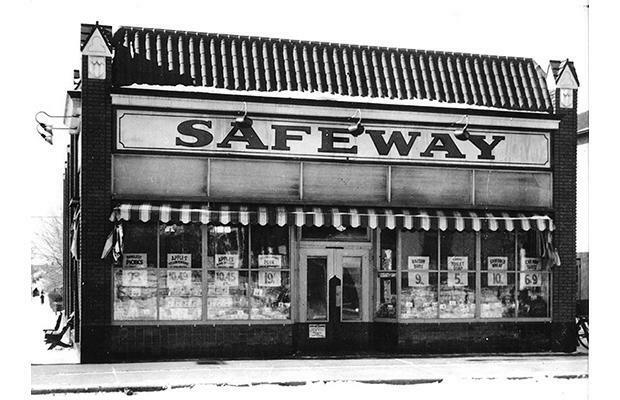 Remaining Marina style Safeways: Main St.; Mountain Ave.; St. Mary's Rd. The now-vacant store at Main and Luxton, which Co-op modified by filling in the top portion of the glass facade, is one of three intact Marina style stores left in the city. The last remaining stores are Mountain Avenue at McGregor Street and the Family Foods at St. Mary's Road and Dakota. I'm sorry to read about the probable loss of this architectural style! 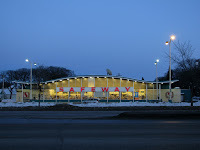 I loved our Safeway (Pembina and McGillvary) while growing up in Fort Garry. For years it was the only large grocery store in the area. So iconic! It was sad when the store and its sign were remodelled. The new store is unremarkable whereas the old style had real flare. Too bad the "retro" look could not be marketed to its advantage! Thanks for the piece. It brought back good memories. eToro is the most recommended forex broker for novice and professional traders.